Can Following Too Close Cause a Car Accident? In Florida, car accidents on both busy highways and in rural areas are common. Often, these are not serious car accidents but are “fender benders,” where only minor vehicle damage and injuries occur. However, even when damages aren’t life-threatening, they can still be costly. Rear-end collisions are frequently caused by tailgating, or following too closely. Here’s what you need to know to reduce the risk of this type of car crash. Under Florida Statute 316.0895, a driver “shall not follow another vehicle more closely than is reasonable and prudent, having due regard for the speed of such vehicles and the traffic upon, and the condition of, the highway. Legally speaking, there is nothing in the Florida Statute that states how close is too close. The general consensus, however, is that you should allow one car length in between you and the car in front of you for every 10 mph you are driving. This means that if you are driving 75 mph on the highway, you would want leave about 7 or 8 car lengths between you and the other driver. What Should You Do If Someone Tailgates You? 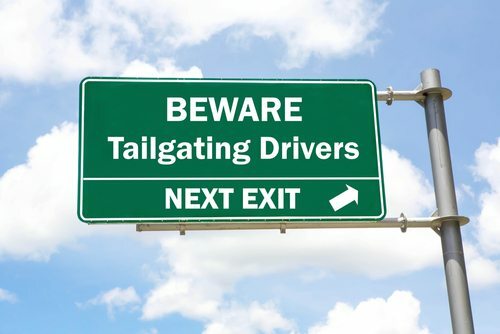 If you are being tailgated, don’t be tempted to slow down even more to annoy the driver behind you. Instead, simply pull off to the side of the road and allow them to pass you, and then resume driving. Were You Rear-Ended by Someone Following Too Close? If you were involved in a rear-end collision that was caused by someone tailgating your vehicle, you may be eligible for compensation to cover the vehicle damage and any medical costs you incurred as a result of the car accident, plus other damages if applicable. In order to bring a claim forward for financial restitution, you need to contact an experienced car accident lawyer for assistance. At the Slonaker Law Firm, we have the skills and resources needed to aggressively represent you in a rear-end collision claim. Don’t wait — contact us today to learn more about your rights and what your next step should be after being hurt in an accident. Call now for a consultation to speak with our attorneys at (352) 629-6656. We are available now to help you.